For other uses, see Noren (surname). Noren were originally used to protect a house from wind, dust, and rain, as well as to keep a house warm on cold days and to provide shade on hot summer days. They can also be used for decorative purposes or for dividing a room into two separate spaces. Exterior noren are traditionally used by shops and restaurants as a means of protection from sun, wind, and dust, and for displaying a shop's name or logo. Names are often Japanese characters, especially kanji, but may be mon emblems, Japanese rebus monograms, or abstract designs. Noren designs are generally traditional to complement their association with traditional establishments, but modern designs also exist. Interior noren are often used to separate dining areas from kitchens or other preparation areas, which also prevents smoke or smells from escaping. Because a noren often features the shop name or logo, the word in Japanese may also refer to a company's brand value. Most notably, in Japanese accounting, the word noren is used to describe the goodwill of a company after an acquisition. 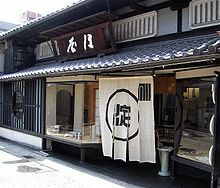 Sentō (commercial bathhouses) also place noren across their entrances with the kanji 湯 (yu, lit. hot water) or the corresponding hiragana ゆ, typically blue in color for men and red for women. They are also hung in the front entrance to a shop to signify that the establishment is open for business, and they are always taken down at the end of the business day. ^ MATCHA. "Japanese Encyclopedia: Noren | MATCHA - JAPAN TRAVEL WEB MAGAZINE". MATCHA - JAPAN TRAVEL WEB MAGAZINE (in Japanese). Retrieved 2017-03-18. ^ "Japanese Noren | Uses & History of Japanese Noren". The Japanese Shop Blog. 2013-09-27. Retrieved 2017-03-18. ^ O'Donoghue, J. J. (2017-01-14). "Curtain call: Examining the evolution of Japan's humble 'noren'". The Japan Times Online. Retrieved 2019-02-04. ^ Noriyuki, Yanagawa (2015-08-10). "Young Japanese Firms Quick to Adopt International Accounting Standards". nippon.com. Nippon Communications Foundation. Retrieved 2019-02-04. ^ Shobu, Johana (2016-05-04). "6 Japanese Onsen Etiquette Tips Every Traveler Should Know". The Loop HK. Retrieved 2019-02-04. ^ Williams, CC (2017-05-06). "Empire of Signages". The Site Magazine. Retrieved 2019-02-04.